It resembles a pink banana squash (a variety we have not grown in several years), but who knows! 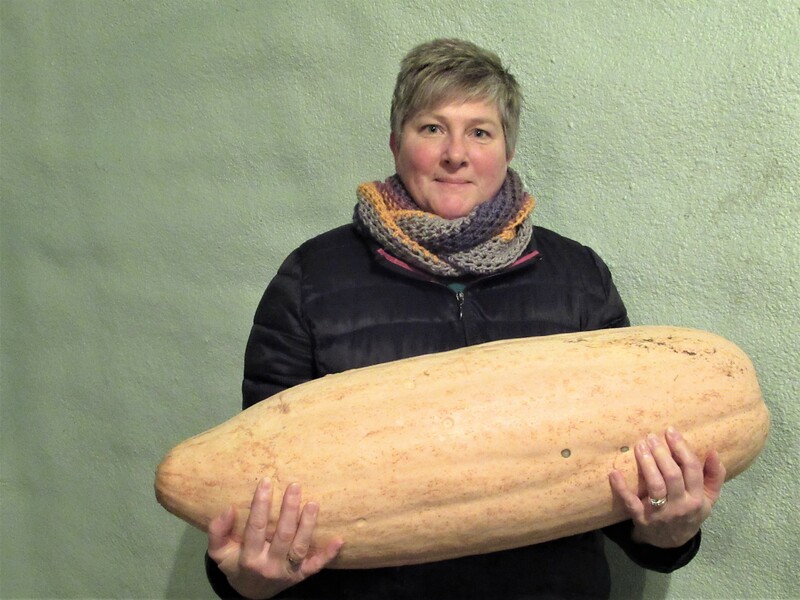 The squash had several smaller siblings which we took to market where they sold quickly. This monster was too big – takes up too much room in the truck, plus a little awkward for someone to lug home on the subway! There are now 2 small, dark spots appearing on the side & the stem end is getting soft. Before it spoils it will have to be eaten – either by us or the chickens. Most likely it will be both us and the chickens. Seems there should be plenty for all! It will be interesting to see what it’s like inside & what it tastes like. We still have other “fresh” vegetables left in the barn that we are eating. There’s a few assorted squash – mostly butternut, some onions, garlic, a handful of wilted carrots & several large, winter kohlrabi (the same as the kohlrabi we had in the summer, just way, way larger). And tucked into our fridge is a bag with 2 Chinese cabbages. The onions & garlic are always useful & a welcome part of our meals, but the rest … let’s just admit that we lose our excitement for these roots by the new year. Fortunately we put a lot of vegetables into the freezer last summer including peppers (sweet, hot, & roasted), roasted tomatoes, zucchini, spinach, kale, corn, edamame, squash, and some herbs. We also dried some herbs & hot peppers, made some jam & jarred a whole lot of tomato sauce & salsa. We definitely will not go hungry! But that doesn’t stop the craving for fresh-from-the-field vegetables. This season’s seeds are arriving in the mail daily. As I unpack the boxes and check the packages I dream of juicy, warm cherry tomatoes, crunchy cucumbers, crisp lettuces and even eggplant. They suggest not grocery shopping when you’re hungry. Similarly, it’s not helpful to choose your crops & shop for seeds when you’re desiring fresh food! The result is more seeds, of more varieties, of more vegetables, than we had planned to grow! It felt good to spend a few hours outside on the farm this week. 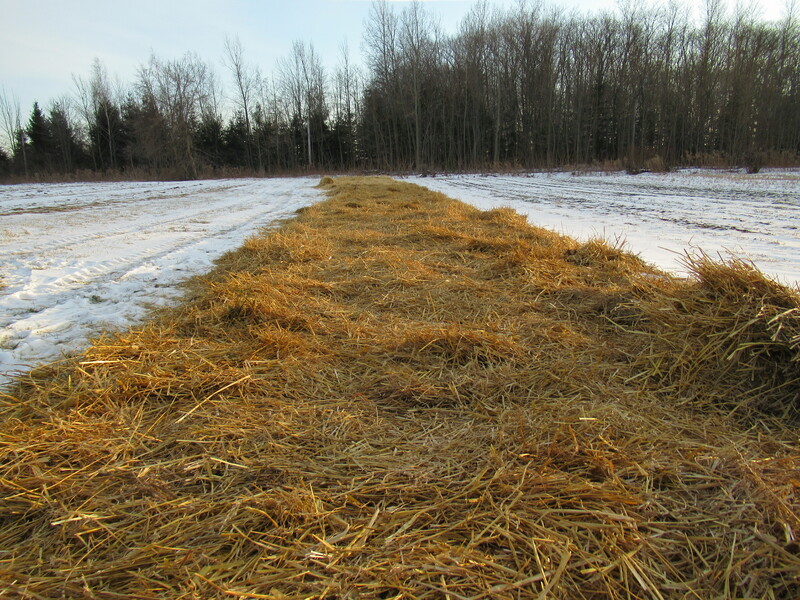 We finally got the garlic patches mulched with a thick blanket of straw. We prefer to do this when the ground is frozen but without much snow. 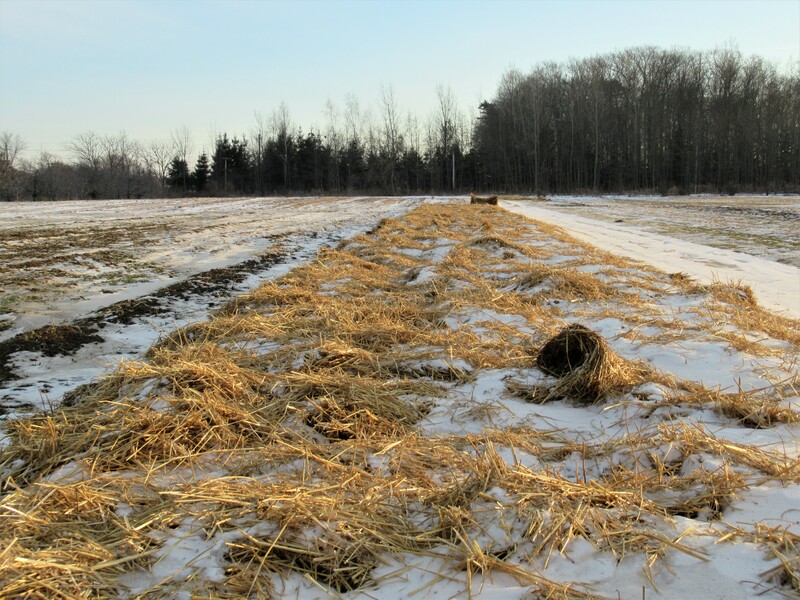 The straw will then keep the soil frozen throughout the freeze/thaw cycles of our winter and prevent the garlic cloves from heaving & being pushed out of the ground. When spring finally comes and the garlic sprouts & grows, the straw will prevent the weeds from growing too, and competing with the garlic. We like to stay warm & cozy in the winter – and so does the garlic!